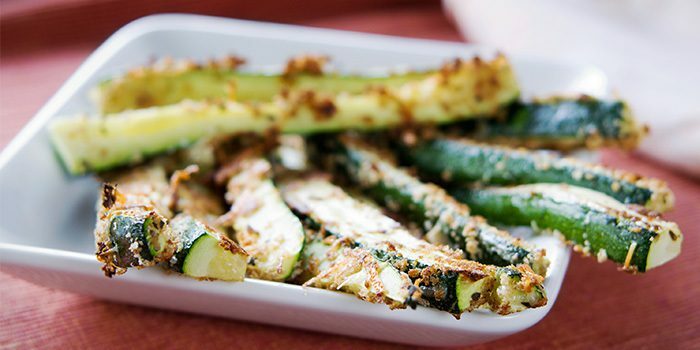 This tasty snack or side dish has flavor and crunch. 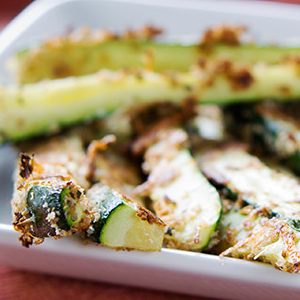 And, our zucchini fries have only 74 calories per serving! Line baking sheet with foil; lightly coat with spray. Combine flour, cornmeal, salt, and pepper in a large resealable plastic bag; shake to combine. Working with a few pieces at a time, dip zucchini in egg whites and lift out, letting excess drip back into bowl; drop zucchini into bag containing flour mixture. Seal bag and shake to coat. Repeat with remaining zucchini. Place zucchini on prepared baking sheet. Bake for 12 to 14 minutes, turning after 6 minutes, or until tender-crisp and golden brown.